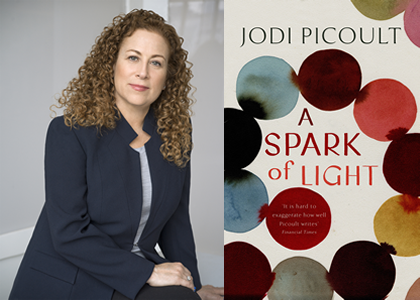 Join international bestselling author Jodi Picoult at this lunchtime event as she talks about her latest book A Spark of Light, a powerful and provocative novel about ordinary lives that intersect during a heart stopping crisis. As one of the world’s most popular writers of contemporary fiction with over 25 million books sold across 35 countries, Jodi Picoult is renowned for tackling some of the most pressing and hotly debated issues of modern society. In her last novel, Small Great Things, Jodi took on the subject of race and prejudice. This October she returns with A Spark of Light, looking at reproductive rights from all angles. A Spark of Light begins with a gunman opening fire in a women’s reproductive health clinic. Each successive chapter then moves backwards hour by hour showing the lives of the medical center staff, the female patients, the shooter, and a hostage negotiator outside the building — and the complicated ways their lives intersect. We’re thrilled to be bringing Jodi Picoult to Oswestry when she tours the UK this Autumn. Don’t miss this chance to see and meet her!